Using the systemd command hostnamectl is the most convenient way on how to find the version of Redhat Linux installed. Red Hat Enterprise Linux Workstation users can also retrieve Redhat Linux from graphical user interface. For more detailed options visit our guide on how to check RHEL version. 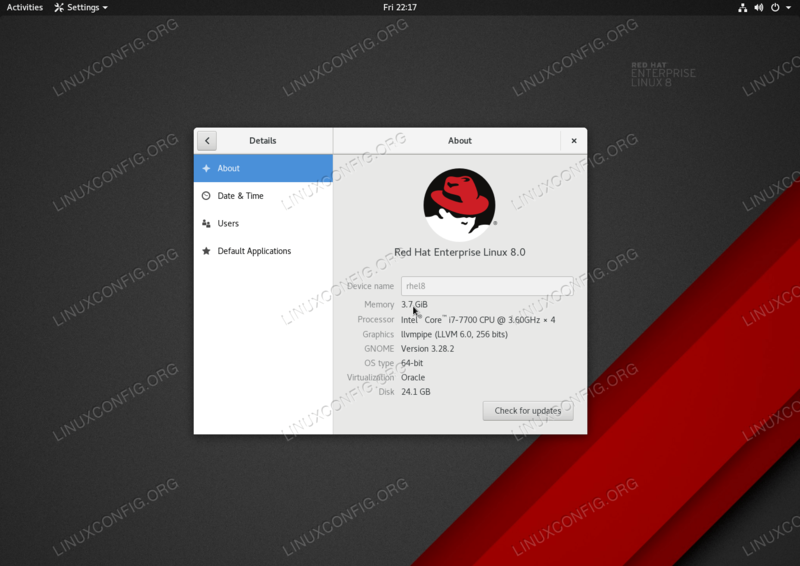 How to find Redhat Linux version from GUI. 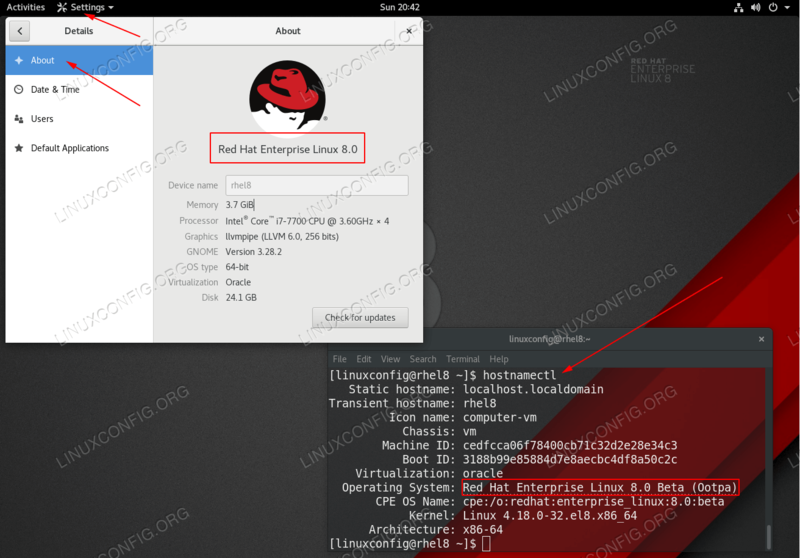 How to find Redhat Linux version from command line. In this tutorial we will be installing the Virtualbox guest additions on Redhat 8 Linux. Virtualbox guest additions allows for better screen resolution and mouse integration. How to install Virtualbox guest additions compilation prerequisites. How to mount Virtualbox guest additions ISO image. How to execute Virtualbox guest additions compilation and installation. How to check Virtualbox guest additions installation. How to Register your system to Red Hat Subscription Management. How to Attach RHEL 8 subscription to your system. How to Enable RHEL 8 Repository. How to Disable RHEL 8 Repository. RHEL 8 comes by default, as it has been for many years already with a GNOME desktop environment. From this reason, in a broader sense when we talk about GNOME desktop installation we normally talk about RHEL 8 workstation. In this tutorial we will be installing GNOME desktop as part of the workstation package group. How to install Gnome Desktop on Redhat 8. How to change runlevel to boot to graphical interface in Redhat 8.